ALLS Independent Media Monitoring Team: Archimandrite Dorotheus: "We were able to convey to the Ecumenical Patriarchate that the problem does exist"
Archimandrite Dorotheus: "We were able to convey to the Ecumenical Patriarchate that the problem does exist"
Here we offer readers some of the important interviews which surely clarify some details and situation occurred in the Abkhaz Church particularly in regard with the article "Another Abkhaz Debate" by Brittany Pheiffer recently published in http://www.evolutsia.net/another-abkhaz-independence-debate/. PRAGUE—Patriarch Bartholomew of Constantinople gave an audience to the Head and members of the Council of the Holy Metropolis of Abkhazia yesterday evening. The delegation received a promise from the Patriarch to consider the Abkhazian issue at the meeting of the Holy Synod of the Patriarchate of Constantinople, said the Head of the Council of the Holy Metropolis of Abkhazia Archimandrite Dorotheus (Dbar) in the interview. Demis Polandov: Father Dorotheus, the Patriarch Bartholomew of Constantinople granted audience to a delegation of the Holy Metropolis of Abkhazia. Could you tell us how the meeting went and what are the results? Archimandrite Dorotheus: We arrived there by the invitation of the Ecumenical Patriarchate, the delegation consisted of five people: me, father Andrew, father David (Sarsania), Secretary of the Metropolitan Council Herman Marshania, and Timur Dzidzaria, member of the Council. His Holiness the Patriarch of Constantinople said that all the material relating to the issue of the church problem in Abkhazia was received, including an appeal from the Church and National Assembly. All these materials have already been considered. For our part, we have told what is happening here now, what occurred in the history and what we would like to see in the future - what is the settlement of the Abkhazian Church issue. That is the definition of the status of the Holy Metropolis of Abkhazia, ordaining of the Abkhazian bishop, the further development of the Abkhazian Church and its full revival. Patriarch said that we could inform the people of Abkhazia, that the Ecumenical Patriarchate of Constantinople as the mother church will make every effort to resolve the issue. The first thing to happen is that our issue is to be considered at a meeting of the Holy Synod of the Church of Constantinople. Demis Polandov: Father Dorotheus, what exactly would be considered at a meeting of the Synod, how will the question be formulated? Archimandrite Dorotheus: I can not tell you anything, it's not in my competence. But the Synod will probably consider our appeal on behalf of the Church and National Assembly, in which we have described the situation, what we would like to have, etc. Then, apparently, consultations, issues, etc. will start. But this is a very important question, because the Ecumenical Patriarchate, as you know, is the only church in whose competence lies the solution of the Abkhazian issue. Without the participation of Patriarchate of Constantinople we could have long years to go and discuss various topics on the Abkhazian issue, but not coming to some significant and concrete solutions. Therefore, the most important what we have achieved after the National Assembly of the Church, after all these last few months of active work both inside and outside Abkhazia, is that we have been able to convey to the Ecumenical Patriarchate that the problem does exist. This was deliberately held back by the people who did not want to solve the Abkhazian Church problem. And most of the representatives of the Georgian Church have never spoken about this problem anywhere. This meeting was attended by the Chairman of the inter-Orthodox Commission too. And at the session of the inter-Orthodox Commission, in which the representatives of all churches take part, nobody ever spoke about the problem in Abkhazia. Therefore, today the church problem existing in Abkhazia became evident and clear for all and the inadmissibility of what is happening here, that for eighteen years we have had no bishop, and that part of the Abkhaz people, which is Orthodox Christian, needs assistance to solve the problem of the church. This is the most important thing. Demis Polandov: Father Dorotheus, the last question. Do you know when the meeting of the Holy Synod of the Church of Constantinople at which your question will be considered will take place? Archimandrite Dorotheus: Now I can not say which program our problem will be included for consideration, but the Synod will be held soon. Yet I am not aware of any concrete dates, but judging by what we were talking and discussing, I think, the problem resolving will not be postponed for a very long time. I think concrete proposals will be forthcoming probably soon. PRAGUE—January 13 at the official website of the Constantinople Patriarchate was published the news about the meeting of Patriarch Bartholomew I with Archimandrite Dorotheos (Dbar) and other members of the Abkhazian delegation. First information about the meeting earlier caused a cautious and rather restrained reaction of the Georgian Patriarchate. At the same time, the Russian Orthodox Church representatives were far harsher in the assessments of this visit. Thus, the deputy of the Chairman of the Department for External Church Relations Archpriest Nikolay Balashov called the priests of the Holy Metropolis of Abkhazia dissenters and said that the Ecumenical Patriarchate of Constantinople is not authorised to solve the Abkhaz issue. We decided to discuss this situation with a member of the Council of the Holy Metropolis of Abkhazia Hierodeacon David (Sarsania). Demis Polandov: Father David, the Abkhaz delegation's visit to the Patriarch of Constantinople has caused quite a strong reaction in the Russian expert community, the number of official representatives of Russian Church in some media rather sharply reacted to the visit. Could you comment on this reaction? Hierodeacon David: Yes, of course. I know that the Archpriest Nikolai Balashov, who is a deputy of the Chairman of the Department for External Church Relations, yesterday stated the position of the Russian Orthodox Church regarding the meeting of the clergy of the Holy Metropolis of Abkhazia with His Holiness Patriarch Bartholomew of Constantinople. Moreover, this statement was translated into Greek, and appeared in the site Romfea. I can tell you that Father Nikolai Balashov and those who closely follow the events developing in the life of the Church of Abkhazia, are very interested in the highlighting mainly their position everywhere. As for our Holy Metropolis of Abkhazia the Russian media is working unilaterally. We have been quoted only by portal Credo.ru, that's all, and other Russian Church websites, highlighting the religious life, do not wish to publish our point of view. I can say that the position of Father Nikolai Balashov, stated yesterday, is understandable. You see, in general, what is happening in Abkhazia today is the result of a general policy of the Department for External Church Relations of Moscow Patriarchate. Demis Polandov: Father David, and what, in fact, this policy is? What does Moscow want? Hierodeacon David: I want to say that we respect the piety of the Russian Orthodox people, but the policy of the Department of External Church Relations is not the one that would promote strengthening of Christianity at the Caucasus. The attitude of Father Nikolai Balashov, and of the Secretariat for inter-church relations in the time of his rule has always been biased to the problems of Abkhazia: it was very unpleasant for them if the situation became active or an attempt appeared to go out of the critical situation occurring in Abkhazia. They need to preserve this situation frozen, keeping it in a vacuum and without any way out. That is how I understand their position. And today when some activity starts, they are not ready for the initiatives coming from our side. Demis Poland: You should have read an interview with Father Vissarion, in which he comments on your visit to the Patriarch of Constantinople. Could you respond to his statement? Hierodeacon David: Father Vissarion goes wrong now, making such statements. First of all, he forgets that his canonical status is still not resolved; he remains the official cleric of the Georgian Orthodox Church. And neither the Synod of the Russian Orthodox Church, nor the Synod of the Georgian Orthodox Church did not raise the question of his moving to the Russian Orthodox Church. When he says that twenty clergymen in Abkhazia with him are the Abkhaz Orthodox Church - it is a perfect lie, because in Abkhazia these clerics are in violation of the canons. They have no documents that give them the right to stay on the territory of this diocese. When he says that the universal Orthodox Church allegedly leads the church life of Abkhazia, and then he says that His Holiness Kirill personally for him is a ruling bishop, everything is a lie. When we now referred to the Ecumenical Patriarchate of Constantinople and had a conversation with His Holiness Patriarch Bartholomew I, we explained to him the difficulty of our situation. What we are doing today is in accordance with the sacred canons of the Church. Our people support us, we had the opportunity to speak with them at the Church and National Assembly in May 15, 2011. We promised the people who gathered there to bring this matter up to the end. His Holiness Patriarch Bartholomew received us and he listened to us. We do everything in accordance with holy canons of the church to resolve this situation. The outrageous behavior of Father Vissarion (Aplia), unfortunately, make happy some people in the Russian Orthodox Church. I think, if father Nikolai Balashov finally finished his career as a bureaucrat and retire, his place will be taken by a decent man who will not just be engaged in ecclesiastical diplomacy, and will look for an opportunity to unite the Orthodox nations, but not to look for the rivalry between the Russian Orthodox Church and the Patriarchate of Constantinople, not to look for possible ways to control the Georgian Orthodox Church, using the conflict in Abkhazia and the unresolved problem of the Abkhaz Church ... If a person will appear to be guided, by the Gospel, above all, desiring the good for the Russian Orthodox people, the Abkhazian Orthodox people, and the Georgian Orthodox people, but not to play in the so-called ecclesiastical politics, it would be easier to live for all of us, and then we could solve all our problems, which, unfortunately, involved nationalism and even some bad manifestations of human weaknesses. Demis Polandov: Father David, both Russian and Georgian experts say that most likely the Patriarch of Constantinople can not solve the Abkhaz issue without the consent of the Georgian church. Do you think that the Georgian Church will agree with any suggestion of the Patriarch of Constantinople? And if not, what exactly are you going to do? Hierodeacon David: We have been invited by His Holiness Patriarch Bartholomew to the Patriarchate, we have already talked with His Holiness, and we expect what the Ecumenical Patriarchate will tell us. We referred to the first Orthodox Church in diptych, which historically has a direct relevance in the area. And I do not want to say that I don't know what would happen next. I tell you with certainty that the Ecumenical Patriarchate will find the opportunity to help the restoration of the church life in Abkhazia. And it will be done following the Holy Church canons. The Ecumenical Patriarchate by the canon law is in power to solve the problem of the Abkhazian Church. And we are satisfied with it today. PRAGUE - What did the young clergy of the Holy Metropolis of Abkhazia rise against? In fact - against the seizure of the Abkhaz churches and monasteries by the Russian Orthodox Church with the active approval of father Vissarion (Apliaa). It may seem strange, since the Orthodox of Abkhazia themselves not once appealed to the ROC to take them into their fold. But the point is that the Moscow Patriarchate is ready to take temples and monasteries, but obviously it is not going to build a full-fledged church life for the local Orthodox people. "The Russian Orthodox Church can not canonically interfere in the church life of Abkhazia, that is, to appoint a bishop. Father Vissarion intends to use holy places of Abkhazia for pilgrimage from Russia. But this requires material resources. In my opinion, Father Vissarion has attracted some charitable funds, he promised them to start the construction of pilgrimage centers, or to bring in order what has already been handed over to Father Vissarion. At the same time, in spring, the government of Abkhazia handed over to Father Vissarion a tourist base "Kiaraz" in New Athos. 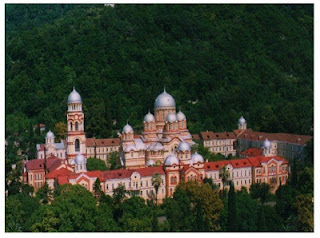 In this connection, I have also a suspicion that there is something behind the fact that Father Efraim (Vinogradov), who was handed the abbot's staff, was sent to New Athos to organize a religious life in the monastery. And together with this to develop and bring into order a tourist or pilgrim facility, which in summer season or further years would have to host thousands of pilgrims from Russia. " Father Vissarion (Apliaa), who is heading a non-canonical Abkhaz Orthodox Church, tried to answer the claims of young clerics at press - conferences, but for the main problem of absence of the Abkhazian Church bishop - he had nothing to say. The ROC not just can not ordain a bishop, but also clearly showed that it would do its best for all other Orthodox churches not to do it. Otherwise, how one can explain a recent severe punishment of young clergy Archimandrite Dorotheus and Hieromonk Andrew, prohibiting them from serving? Even the Georgian Church has never prohibited the Abkhazian priests ordained by it, as the same Father Vissarion. "Prohibition from serving of Father Andrew and Father Dorotheus made by the Russian Orthodox Church can be perceived as an official response to the appeal for more than a thousand members of the Church of the People's Assembly of the Russian Orthodox Church with the request to participate in resolving church problems in Abkhazia. If the Russian Orthodox Church will block the possibility of organizing the commission on religious issues in Abkhazia, of course, for us it will be a very important signal. But I hope that the local Orthodox churches will find strength to help Abkhazian people to find a canonical solution to their religious problems." "I can express my personal opinion. I believe that a possible dialogue with the Georgian Orthodox Church, perhaps, in the future will be required. Thanks to the Father Vissarion and his clumsy attempts at negotiations with the Georgian hierarchy, we are having a crisis situation now. Father Vissarion personally talked with representatives of the Georgian Patriarchate and made it quite hypocritical. He said one thing to Georgian bishops, and in Abkhazia another - both to politicians, the government and the people ", - said David Hierodeacon (Sarsania). Great!Very much interesting information and things which people do not know.Thank you for presenting it. Политика «непризнания» – нейтралитет или политизация? Канонический статус православной общины Абхазии и восстановление независимой церкви Абхазии.